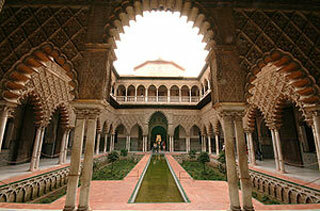 The Alcázar of Seville ("Royal Alcazars of Seville") is a royal palace originally developed by Moorish Muslim kings. The palace is renowned as one of the most beautiful in Spain, being regarded as one of the most outstanding examples of mudéjar architecture found on the Iberian Peninsula. The upper levels of the Alcázar are still used by the royal family as the official Seville residence and are administered by the Patrimonio Nacional. It is the oldest royal palace still in use in Europe. This article uses material from the Wikipedia article "Alcázar of Seville", which is released under the Creative Commons Attribution-Share-Alike 3.0 License.